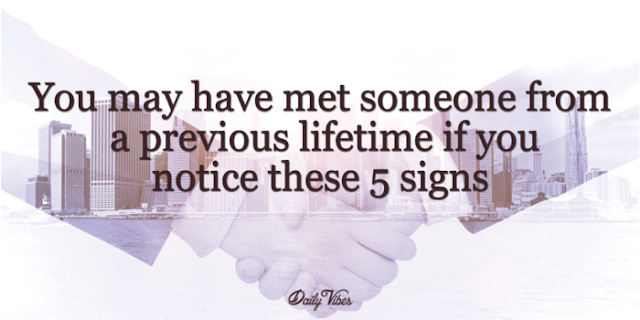 You know the feeling….you meet someone for the first time and feel as though you’ve known them forever. It’s happened to me quite a few times. You have an instant connection. You immediately feel comfortable and safe and aren’t afraid to be your true self. You know this person will accept you – the good, the bad – everything. Well, chances are it’s because you knew them in a previous life. Below are 5 signs that someone you just met is someone you knew in a previous life. You feel an immediate bond with this person. You are able to effortlessly carry on a conversation and feel totally comfortable in their presence. You just know that, no matter what, this person will accept you for who you are. When you’re together, the time flies by. You decide to meet up for lunch, start talking, and before you know it, it’s time for dinner. You can also be apart for long periods of time and, when you meet up again, it’s as though you’ve never been apart. You don’t feel judged or uncomfortable in their presence. It feels like looking into their eyes is like looking into your own. You feel one and the same with them; like you have connected with someone who knows your soul to the core. Many think that deja-vu comes from past memories from another life. When you have a lot of deja-vu, specifically surrounding one person, it could be because you’ve been in similar situations before with that person in a past life. You feel an immediate positive response and know you can fully trust this person. Or, you feel an immediate negative response and want to get as far away as possible. If you’re feeling a negative vibe with someone, go with your gut and get far away. Chances are they hurt you in some way in a past lifetime and will do the same again.